Dr. Paola was in the process of purchasing her first dental practice and after doing a lot of market research online she came across one of our client’s websites, Highpoint Dental Medicine, that really struck her interest. She was extremely impressed by its modern design, presentation and how it clearly stood out from the rest. After learning who created the site she contacted Nexvel and gave us a huge opportunity to do something we love, that was to create her a new brand from the ground up. Dr. Paola’s vision for her dental practice was to create a brand that incorporated the “Harmony” between dental health and the natural world. In a short amount of time, and on the first try we created logo design and a color pallet that perfectly harmonized her vision. From there, we scaled her brand into consistent business cards, letterhead, direct mail and website design. Additionally, we helped her new practice gain immediate search engine exposure to make it easier for new patient’s to learn about her fabulous new practice. In a very short amount of time NexVel was able to grow a vision into brand and generate hundreds of web contacts. 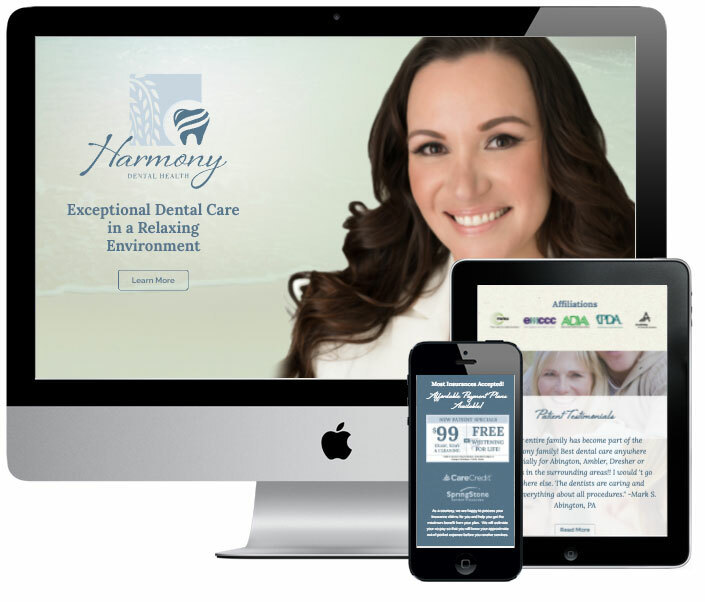 Today, Harmony Dental is a healthy growing practice with over 81 online reviews and competitively ahead in the search engines in targeted areas. New patient engagement is growing and we are excited to see how additional campaigns like direct mail and paid advertising will continue to help Harmony reach the next level in their first year of ownership.